Game 3: 1250 Blood Angels & Tau vs. Chaos & Eldar | 30mm Madness! My parter was a Tau player, Will. 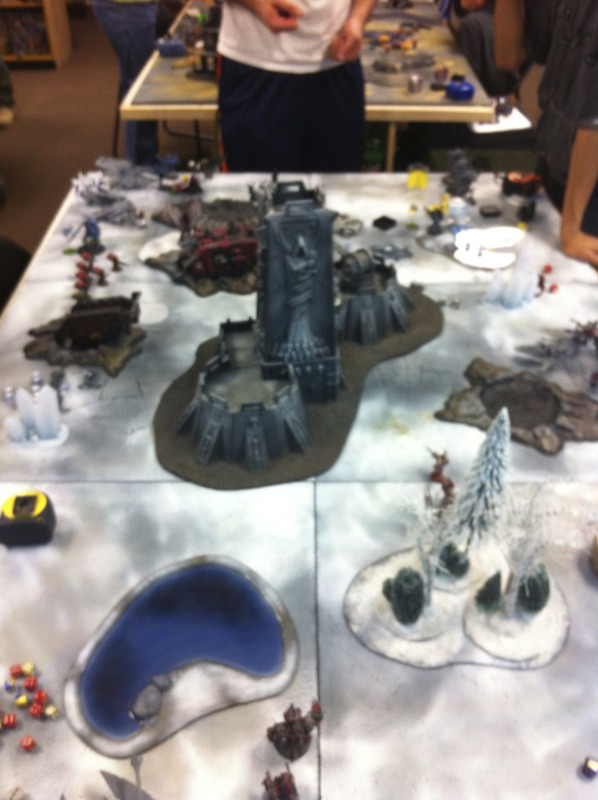 Opponents were Mark (Eldar) & Mike (Chaos Space Marines). We lost the roll to decide who chooses deployment order, our opponents went first. It was interesting… we rolled off TWICE with both sides rolling snake eyes, finally on the third roll of there was another 1 (us) and a 5 (them). We got hit HARD with an alpha strike. I lost my vindicator and my dreadnought at the very top of turn 1… which meant that 15% of my army didn’t do anything before dying. I also choose to deep strike my two assault squads… so there weren’t a lot of models on the table in turn 1 which meant we soaked up a bunch of pain right off the bat. Time to rethink my list, moving away from a DOA strategy… maybe mechanized assault. This entry was posted on June 14, 2012 by justinhardin. It was filed under Battle Reports, Blood Angels, Warhammer 40K and was tagged with alpha strike, chaos space marines.